Former World champion Michael Katsidis has made the decision to resume his boxing career. DO YOU REMEMBER the scene out of Rocky Balboa when Rocky says to Paulie 'There is still some stuff in the basement' well that's a scene Michael Katsidis can probably relate to. No one can ever argue - Michael Katsidis is a fighter. "I came home to Toowoomba to help a friend who did so much for me not only in the good times but more importantly in the low times," Katsidis said. "When I arrived home I asked Brendon - what can I do to help? One of his responses was - I have a gym full of fighters getting ready to fight on June 27 and I know you can be a big help them. "So that's what I did, whether it was in sparring, pushing them on the running track, sitting and talking with them in the sauna - whatever was needed. "For the first time in my life my focus wasn't my own career or myself in general - it was about others. "That's the way Brayd was and that's one of the lessons I learned from him and in recent months I think I've put it into practice. "It's ironic - I didn't come back because of boxing but I believe boxing has found me again. "So here we are and let's see how far we can get. "When you're around fighters, around boxing events - as a fighter, I won't lie it gets the fire burning inside. "I believe I've still got a bit in the basement and it's time to release it." Katsidis said. It's almost back to the future, Michael Katsidis is once based out of Toowoomba and trained and managed out of Smithy's TGW Gym. He will be trained under the team of Brendon Smith and Steven Spark. "I honestly feel re-born," Katsidis said. "Toowoomba is a wonderful place, I just smile thinking about that. "I've seen how they have treated me since I've returned and I can't say thank you enough. "Yes I've made my mistakes in the past, but it's never too late to be a better person. "That's what Brayd taught me and I'm determined to be a better person. "I've been working with Steven Spark in the gym. "He's an amazing young trainer almost a clone of Brendon. "He's a fantastic trainer, mature well beyond his years. "I understand why Brendon has so much faith in him. "I have the same faith in him. "What a team, I'm trained by Steven Spark and Brendon Smith - it doesn't get much better than that. "I can't wait to hear the ring announcer once again say those words I love hearing 'from Toowoomba, Queensland Australia, trained by Brendon Smith and Steven Spark out of Smithy's TGW Gym'." 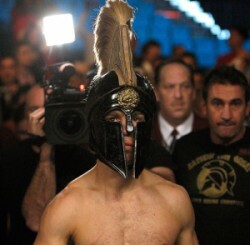 The million dollar question - when, where and who will Michael Katsidis fight?? "Good question," Katsidis says with a laugh. "I don't care, I would love it to be in Toowoomba, because as my mate Jack Asis would say 'this is my home town',"
"I'll leave that in the hands of the man who's always looked out for my best interests - Brendon Smith," Katsidis said. Smith added: "Baby steps at the moment, but there are plenty of options out there for Michael Katsidis. "Mick has thought long and hard about coming back to boxing and I respect his wishes and he's asked for my help so i'll do my best for him. "There are a number of fighters around the super feather,lightweight and junior welterweight divisions in this country making plenty of noise at the moment. "Will Tomlinson is back in Australia campaigning at light weight - who knows what happens down the track but that's a fight I'm sure many people would love to see. "China is a realistic option as well. "When Liu Gang was here for our last show he instantly recognised Michael and inquired into his availability for a show later in the year. "Michael is still a big name around the World and has a big profile. "I will explore the China option further now. "We have a show in Toowoomba on October 31 - that's an option as well. "Michael has been all over the World and he's been to the top of the boxing tree. "The last few years his career hasn't gone to plan but for his deeds in boxing I believe he should go out on his terms. "Now he has the chance. "We're not kidding ourselves, at thirty four years of age we realise it's probably now or never. "One thing I know about Michael Katsidis - he'll give this his best shot. "He seems very settled back in Toowoomba and you know what they say - there's no place like home. "Toowoomba is home to Michael Katsidis. "Wherever we end up we will champion Toowoomba. "Why? because we love this city!"